I am working on the photos and videos, but in the meantime let me tell you more about the Fiesta. Since we stayed 2 miles from the event and walked back and forth to it a couple of times each day, we decided to track our exercise. We did this using our smartphone app CardioTrainer. We walked at least 12 miles a day and learned that by Sunday night we had burned 1600 calories each over the last couple of days just walking. Concerned that our caloric intake was not sufficient to sustained our increased metabolic rate, we searched the balloon festival for an food item with sufficient calories to prevent a severe loss of our fat reserves. Fortunately for us we found just what we needed in a Southern Delicacy being served right at the Balloon Fiesta. 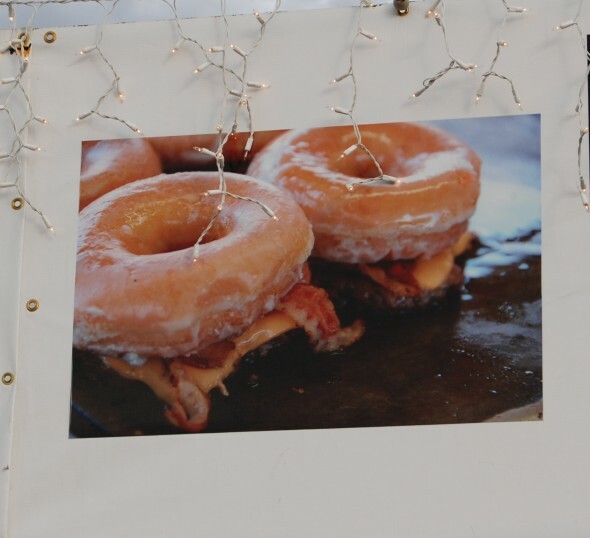 Taaa – daaa, the ever popular Krispy Kreme Bacon Double Cheeseburger! Yummmmy! Next, it will be a Quadruple Bypass Burger, Flatliner Fries, and a Butter-fat Shake at the Heart Attack Grill.